Many visitors to Elba stick to their beachside town. But the interior is also worth exploring, on foot or by car, as there are lots of little villages, ancient forts and old churches, both ruined and still functioning, to visit. Elba has accommodation for every budget, from camping grounds to luxury resorts. It's worth looking beyond the capital though, as some of the best places to stay on Elba are outside Portoferraio. Elba gets a bad rap because Napoleon was unhappy about being exiled here. But me thinks the general doth protest too much - he was exiled to a Tuscan paradise of sunshine, warm, clear seas, wild flower meadows plus fascinating old churches and historic sights. Napoleon's nine months on Elba was lived far from the life of a prisoner - though he did start off his exile in the Torre del Martello, a red coloured tower which remained a prison until 1877. However, he quickly became the Emperor of the island, and moved to the Palazzo dei Mulini - now a museum. And in the summer, when it was hot in Portoferraio, he moved to a villa in the hills, now the Museo Villa Napolenica di San Martino. It was Napoleon who decided Portoferraio would be the island's capital, and he who drew many of Europe's great men to this city. Born as a fortified port, Portoferraio is protected by historic walls, built in the 15th Century and designed to protect it from pirates. Portoferraio's old town is a lovely web of narrow streets heading from the bay to the twin forts on the hill, pinkish Forte Stella and Forte Falcone. Elba has 150 beaches whilst the interior is green all year round, and especially beautiful in spring when it is carpeted with wildflowers. There are plenty of scenic drives on spaghetti-like road systems winding all over the hills - with views that spread from the bright blue sea to the pretty, Tuscan-style hilltop towns. And the surrounding blue seas are rich with marine life. The whole island is within the Parco Nazionale del l'Arcipelago Toscana, so it's protected from development. Elba isn't just naturally beautiful, it's also rich in minerals - which is why it's been so hotly contested through the ages. The Romans holidayed here and quarried materials for their columns, and the Etruscans have also left fascinating traces of their time here. As well as the sights and ruins themselves there are numerous museums displaying ancient treasures belonging to the island's former inhabitants. Whilst the island is surrounded by beaches, we'd recommend in particular the Spiaggia di Sansone, the Spiaggia di Capo Bianco and the Spiaggia del Relitto (all located in Portoferraio). Take the lift up the Monte Capanne and marvel at the stunning panoramic views of the area. Take a tour of the underground Miniere di Capoliveri to learn all about Elba's mining history and the strategic importance of this mine to the Italian government. If you're a fan of museums then be sure to check out the Palazzina dei Mulini or the Museo Naxional delle Residenze Napoleoniche. With such history and beautiful sites many of the best places to stay in Elba are snapped up quickly so be sure to book early. If you're searching for peace in a waterside paradise, the Boutique Hotel Ilio is one of the best places to stay on Elba. Elba doesn't have a lot in the way of boutique hotels, and Ilio, with its 20 individually themed rooms, regular photographic exhibitions and restaurant focussed on serving locally sourced wonders, fills that gap nicely. Weather-wise, Elba's obviously nicest in the summer months - in July the average daily temperature rises to 25°C. This however is peak tourist season, so if you fancy a quieter and cheaper time to visit then consider May or September. Visitors can fly into Elba Airport at certain times of the year, with seasonal flights to and from Florence, Lugano, Pisa, Milan and Zurich among other destinations. 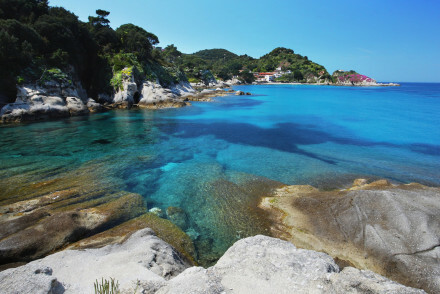 Or, you can fly to Pisa Airport and take the train to Piombino (85km away) before hopping on the ferry across to Elba. Browse though our list of all the best places to stay on Elba. Widen the net to search through our list of all the best places to stay in nearby Corsica.